The young and remarkably talented abstract painter Lise Gervais found herself at the forefront of the Post-Automatist artistic scene when she received a prestigious award at the 1961 Annual Spring Exhibition of the Montreal Museum of Fine Arts. Her work was acclaimed by critics and handled by prestigious dealers such as Denyse Delrue in Montreal and Walter Moos in Toronto. Puck was painted in 1965, at the height of Gervais's career. 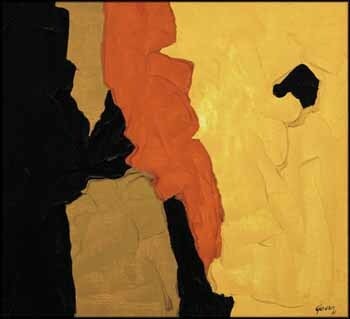 The composition is divided into large interlocking fields of richly textured paint, and the palette of colours - which features different hues of yellow with orange in contrast with black - makes this work an iconic example of some of the best paintings produced by the artist in this exhilarating decade. This exceptional piece was first acquired from a solo exhibition held in 1970 at Galerie de Montréal, a gallery that Gervais and her then partner Yves Lasnier had opened two years earlier on Mackay Street near the corner of Sherbrooke Street West, and is now being offered at auction for the first time.